Can companies keep in touch on a Phono Sapiens planet? We rely on technology more than ever, but the ways in which companies choose to communicate with us can be sadly unreliable. Do you know anyone who doesn’t have a mobile phone? Children aside, I would presume the answer is “no” for almost everyone reading this. In a relatively short space of time, humanity has transformed into a species of Phono Sapiens, a term I use to describe a time where almost every human on the planet has a mobile device, and anything that can be done on a mobile usually is. In parallel to this evolution, most of the ways in which companies try to reach consumers are at a stage of oversaturation, where consumers seek to actively avoid them. App installs are declining (with very few exceptions), and the popular app strategy of “build it and they will install” doesn’t work in an oversaturated market. Email is a bloated channel devoted largely to spam or unwanted communications, and unknown voice calls are usually ignored and seen as a nuisance. Technology which can effectively block adverts on mobile devices has also become hugely popular, much to the chagrin of many advertising agencies. Many of these channels are similarly ineffective for meeting consumers’ needs when they want to get on touch with companies for queries and support. Emails risk falling into the behavioural black hole which currently means that 80 per cent are never opened, and only 2 per cent are clicked, on a good day. Apps are seldom used for customer support as push notifications are one way, all too easy to mute, and have an annoying habit of disappearing once opened. Customer support on social media risks degenerating into a public game of “who can complain the loudest”. Meanwhile does the phrase “Your call is very important to us, please enjoy this 40-minute flute solo” ring any bells? From my experience, it will be all too familiar with many readers. When I shared this same phrase with one of the TEDx team while rehearsing my “Empathetic Connection in a Digital Age” talk last year, one of them shared an anecdote about a local friend who had spent no less than six hours on hold to retailer, so I incorporated this into the final talk. But while these communication channels have been rising (and more recently failing) the world’s mobile phone networks have been acting as gatekeepers to a 25-year-old technology which is remarkably effective in 2018: SMS. Thanks to the overprotective approach of the aforementioned mobile networks, this humble mobile messaging technology never became oversaturated with spam and adverts, unlike its email and voice cousins. But thanks to the rise of Phono Sapiens, SMS has arguably conquered the world of global communication, in a relatively short space of time. In 1994 there was a fraction of a per cent penetration of mobile devices compared to human population on the planet, while last year we reached parity, with 100 per cent penetration. To put the numbers into perspective, more people have access to SMS than email and social media combined. This global ubiquity is unparalleled, and unlikely to be equalled by any other digital method of written communication. So, what does this mean for the “man on the Clapham omnibus”? Our mobile devices are the gateways to our digital selves, and much in the real world as well. On a typical day we answer emails and texts, take photos, book taxis and flights, surf holiday accommodation, interact on social media, listen to podcasts and streaming music, buy event tickets, manage our calendars and connections all over the world, and keep an eye on our health and fitness. So, while Phono Sapiens want to be able to connect with their favourite companies using their mobile devices, most of the available communication channels such as email, advertising, and apps simply aren’t cutting it anymore. In a recent talk “Alexa, Do You Dream?” Scott Galloway, one of the 50 best business school professors in the world, outlined how trust is eroding as a representation of the value that consumers attach to brands, and this is a big deal. If the channels that companies use to try and connect with us are untrusted, but companies want to connect with us, and we want to be able to interact with our favourite brands on our mobile devices, what options are there left to bridge this increasing trust divide? Galloway explained that our mobile phones are one of the last trusted communication channels remaining: “The place where trust still survives is your (mobile) message inbox. We open every text message.” This is thanks in a large part to the gatekeeper approach adopted by the mobile networks. To paraphrase the popular Lord of the Rings meme, one does not simply SMS all of your customers, SMS has been highly regulated for many years, and the penalties for a company sending an unwanted SMS message can be huge. These responsibilities will only increase with the introduction of the GDPR, and compliance is one of the primary reasons that brands choose to work with trusted partners for mobile engagement. Despite the unique success of SMS, 25 years is a long time, especially in technology, so Phono Sapiens are ready for something new. The good news is that some exciting tech is just around the corner: Rich Communication Services or RCS for short. 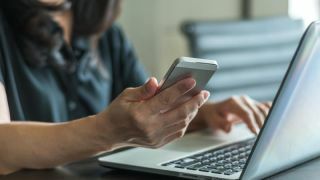 This “upgraded SMS” is coming to billions of mobile handsets thanks to an industry-wide initiative called universal profile run by the GSMA, a trade body that represents the interests of mobile network operators worldwide. Universal profile means new handsets and global mobile networks supporting some very cool new features. RCS will deliver a lot of our favourite app functions such as images, animations, embedded movies, calendar invites, verified sender profiles and much more, but directly into smartphones’ SMS function. The best part of RCS is that once your handset maker and mobile network has enabled it, you won’t need to install any apps to have this rich interactive experience with companies who use it to communicate with you. For example, your airline ticket booking, seat choice, check in and boarding pass delivery could all happen in your SMS inbox, and all that your airline will need to give you this great experience is your phone number and an opt-in. So, while it’s been a rapid and at times bumpy ride in our global evolution to a Phono Sapiens planet, the best is yet to come, and it’s arriving just in time to make everyone’s life that much easier.